I think Valentine’s Day has company when it comes to the most hated holiday on social media. No, I am not “joking around with you,” I am talking about April Fools’ Day. While I have said before that V-Day doesn’t bother me as much as some people, I am with the growing masses when it comes to detesting April Fools’. Never before had I seen the resentment toward the First of April more than this year. A whole week before April 1 I saw warnings about the stupidity others stoop to via social media posts, morning FM radio, and even news programs. The message was simple: Be on the lookout for bogus digital claims by people looking for attention. I am not a big fan of April Fools’ Day on social media. I hate what has become a yearly exercise for many. A person sits down and conjures up some story about having twins, getting married, going off to prison, moving to another country, being abducted by aliens, etc. While most people detect the B.S. immediately, some fall for it. The folks who are duped will respond back with lots of capital letters, emoticons, and questions. Of course this gives the prankster satisfaction and maybe even the motivation to pull a similar stunt the next year. I don’t care for these stupid Facebook jokes mainly because they are just so unoriginal. Millions of people do them each year. The stories are so tired and cliché that these social media users come up with. When I think of a good April Fools’ prank, I think of someone going above and beyond to pull off a legitimate and creative physical joke on someone else. I don’t think of some goober sitting at his computer typing up some tall tale. That is just too dang easy. I also am weary of these “pranks” because the people who do them cheapen the legitimate good news of others. If you get married, receive a big job offer, or have a baby, that should be your moment in the sun on social media. You earned it. However, just because it is April Fools’, others who have not actually achieved anything can act like they did and receive praise for it. To me, there is nothing more undeserving or foolish-looking. I don’t particularly care for it when companies and organizations attempt to pull off elaborate pranks on social media either. Some entities will go to crazy lengths. I much prefer a more subdued approach. 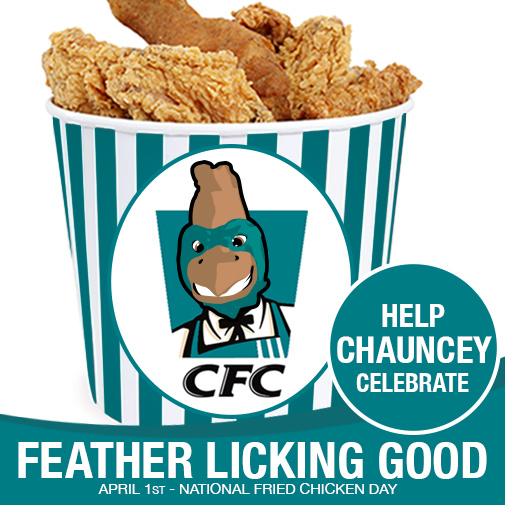 Here at #CCUSocialMedia we just created a cool/funny graphic (A Chanticleer is a rooster) and wished our audience a happy April Fools’ Day. We commemorated the holiday while making people laugh. I think this is much more credible and respectful than trying to pull a fast one. This was our April Fools’ graphic. With all of this said, I have decided that this will be my last blog post ever…(SHUT UP BRENT!!). Okay, just kidding. Happy April Fools’ Day to all, have a wonderful month! Don’t Blink. This entry was posted in Uncategorized and tagged April Fools Social Media, April Fools' Day, April Fools' Facebook status by brent. Bookmark the permalink.